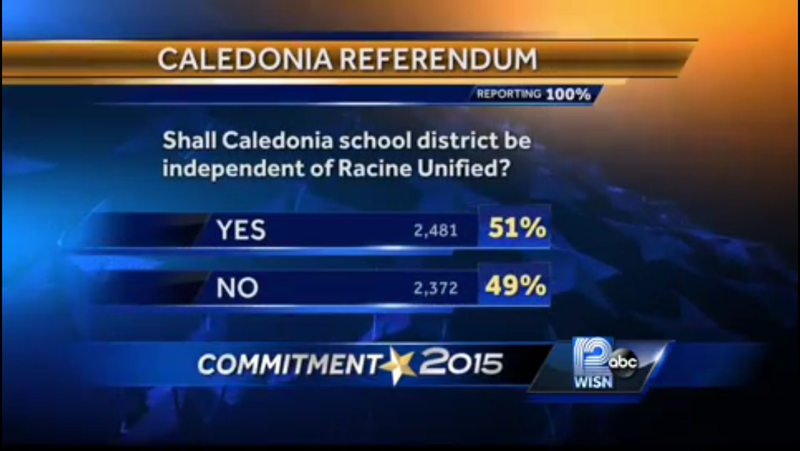 On April 7th, 2015, Caledonia took the monumental step of approving a referendum asking, “should Caledonia pursue an independent school district?” It was reminiscent of an election 10 years before when Caledonia voted to become a village. The vote was advisory, but accomplished the goal of gauging interest in the community and providing the village board with an indication of how to proceed. As with the process of becoming a village, a special bill was needed to give Caledonia the freedom to vote for one. In 2005, the Wisconsin legislature passed legislation allowing Caledonia to become one of the largest villages in the state, and we are now working with our state Senator, Van Wanggaard to do the same now for this project. We have a goal of another election next April, for a final “yes” vote on becoming an independent school district, in coordination with an expected law change. In order to get to that point we need one more action from the village board: to commission a feasibility study on the creation of an independent school district. Any law change will likely include this requirement. Once the feasibility study is complete, our non-profit organization, Citizens For A Caledonia School District will educate the voters of Caledonia for the months leading up to the April 2016 election. Upon approval of the referendum, Caledonia will legally start the ticking clock, and an interim, local school board will be elected to supervise the process over the following years. Thank you for being a part of this with us, and making it a reality. Nothing gets more local that this, and literally thousands of children will be forever impacted by your actions. The course of our village will be instantly improved and our identity as a community will be galvanized. Please stay in touch, via Facebook and by joining our email list!